• Comfortable seating accommodations: It is your right to get good accommodation from an airline. Make sure that your selected airline provides free comfortable accommodations at its points of origin and destination. For example, if you are boarding flights United Airlines run, ensure that they entertain your requests regarding the required assistance for accessing the aircraft or carrying a specialized device for seating if required. • Notifications to the airline: Any pre-flight notifications may not be required in cases of disability. However, there are conditions when such notifications to the airline will have to be provided. For instance, if you want a person with a disability to be attached to the airline’s oxygen system during the course of flying, then you will need to call the airline to give a pre-flight notification. It is best to read all the related policies and requirements of an airline regarding notifications. • Attendant’s travel needs: While major airlines like United Airlines take care of your attendant’s travel requirements, it is best for you to ensure that they give him/her an adjoining seat. If you have such disability that allows you to complete your travel alone, then enquire about the airline’s policy on it and the need for a medical certificate. In some cases, an airline may not find it safe and deny travel to the person with a disability. You must be sure that it does not happen to you. 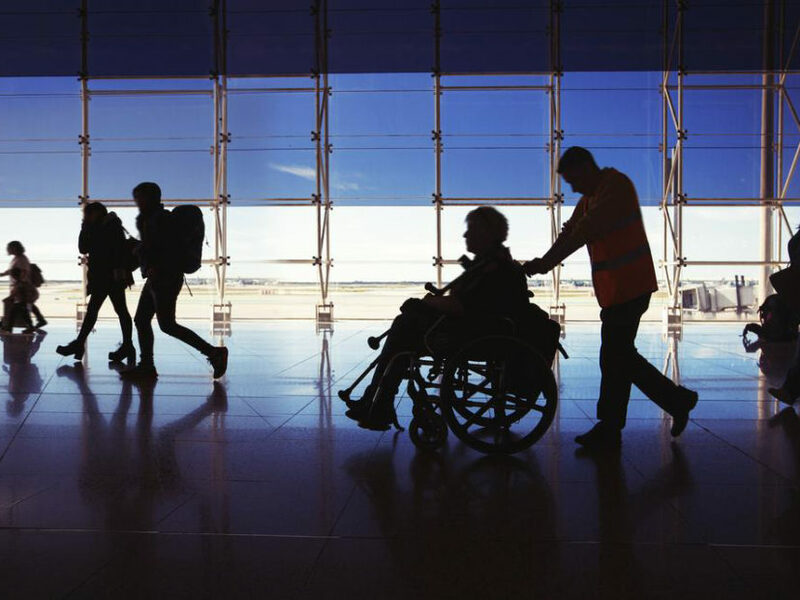 • Assistance at airports: While all major airlines, such as United Airlines, offer various types of wheelchairs at the airport, aisle, and onboard, it is safe to check the type of assistance you will receive during airport navigation, boarding, and on the flight. The airline must have the right equipment for boarding people with disabilities. They should also have qualified employees to assist people with disabilities when they need to go through security checks and screenings or have to visit the utilities. The airlines should additionally have gate agents to deliver all flight-related information to individuals with disabilities, apart from having assistive devices at the airport. • Onboard assistance: Whether you want to travel with an assistant or on your own, you must check whether the airline takes care of your comfort and safety on board. Find out whether they will allocate a disability-friendly seat and give the required safety briefing individually to you. For differently abled individuals, it is critical to check about all support services provided by an airline before they fly with it so as to ensure that their air travel is comfortable.